This book is so heavy that I'm sure it poses a substantial risk to my bookshelves! This is not, repeat NOT, a book to read on the beach. No way. Picking it up can give you the same sinking feeling you got at college when you took the Advanced Statistics course. You know that you're going to learn something of value, but it's not going to be an easy ride. And so it proved with 'The Song of the Greys'. Nigel Kerner's debut book delves deeply into the philosophical (theosophical, as he puts it) side of alien visitation. He ardently tries to reconcile many of his own seemingly conflicting beliefs by constructing a completely new paradigm with which to amply accommodate them all. The result is a mind-boggling piece of alternative literature. I use the word 'literature' because of the quality of Nigel Kerner's writing. His prose is excellent, and his command of English impressive. Such attributes can be rare in the populist field of Ufology, and are commendable. But, in reality, this book is less about Ufology, and more about a modernist reflection on various religious and spiritual systems of belief. Frankly, a lot of the content was unfathomable. Arguments delving into quasi-mystical ideas were built upon a brand new glossary developed by the author. This created a layer of complexity which could have been prevented by using more familiar terms from already available systems of belief, like Buddhism. Nigel Kerner's reinvention of the wheel created quite a vehicular behemoth. Personally, I found it necessary to frequently skip through sections of the book in order just to keep moving. 'The Song of the Greys' presents a complex vision. Mankind devolves from higher beings, which are closer to God. 'Evolution' is a modern myth. Humanity's genetic line has been intercepted at several points by diabolical alien greys, who are soul-less robots seeking enlightenment for their Clone masters. Somehow (and it never really became clear to me how), the aliens seek to return to God through tampering with our DNA. The upshot of this intervention is that certain European 'tribes', based upon the Cro Magnon genetic stock, have become tainted with soul-less, alien traits, and are destroying our world through a manic mix of aggression and Mammon-worshipping materialism. There are a great many problems with this argument, and it is built upon some pretty speculative foundations. Nigel Kerner is reliant upon a version of Ufology brought to us by David Jacobs, and seems less aware of other aspects of this broad subject, which is limiting. He pulls out a series of contemporary articles from mid-nineties issues of 'New Scientist' to back up some of his radical proposals, most of which lack balance in terms of the general positions taken by mainstream scientists. Then he mixes this heady brew of speculation with some pretty deep religious concepts, developed particularly from his Christian background. The result is the presentation of a very personal belief system. Some of the ideas I found commendable, others difficult to justify without a great deal more evidence. But where I found the book as a whole very difficult was its relentless drive. It just kept going. It became very repetitive, particularly regarding the religious sections, which became sermon-like after a while. Some pruning by an experienced Hodder and Stoughton editor should really have been undertaken before publication. As it was, the book was just too overwhelming, at least for me. Despite the difficulty this work presented in terms of its complexity, length and depth, it was thought-provoking and challenging. It would appeal to intellectual Christians who are convinced and troubled by alien abduction reports. 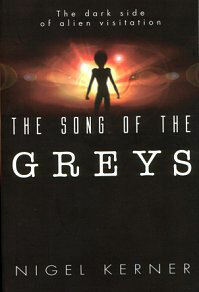 They at least might make some sense of it all in 'The Song of the Greys'. Subtitled "The Dark Side of Alien Visitation"